A fortnight after a standing committee has examined a bill it then reports its decisions for consideration by the House as a whole. The report stage is an opportunity for members not serving on the standing committee to propose further amendments or new clauses to a bill. All members may speak and vote and for lengthy or complex bills the debate may be spread over several days. Bills which have had their committee stage entirely on the floor of the House do not normally receive a report stage debate. In the House of Commons the report stage is usually followed immediately (ie, as the next item of business) by the bill's third reading debate. Although most bills have their committee stage on the floor of the House in the Lords, a report stage, similar to that in the Commons, still follows two weeks later for bills of considerable length and complexity. 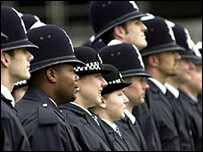 One such example was the Police Reform Bill which reached the Report Stage in April 2002. The Lords threw out contoversial powers for the Home Secretary to intervene in failing police forces. An entire clause outlining the power from the Bill was blocked after opposition parties in the Lords combined forces. During the Report Stage in the Lords, the clause was defeated by 205 votes to 131, a majority of 74.